I saw this on Facebook, it is a repeat of something I've heard all my life. People believe that second children are more likely to be "troublemakers" (or insubordinate) than the other children of the same couple. Furthermore, it claims there's a "new study" backing this up. Is there such a research? Did it find something consistent with this belief? In scientific research, it's important to build up a body of evidence before we can draw conclusions. 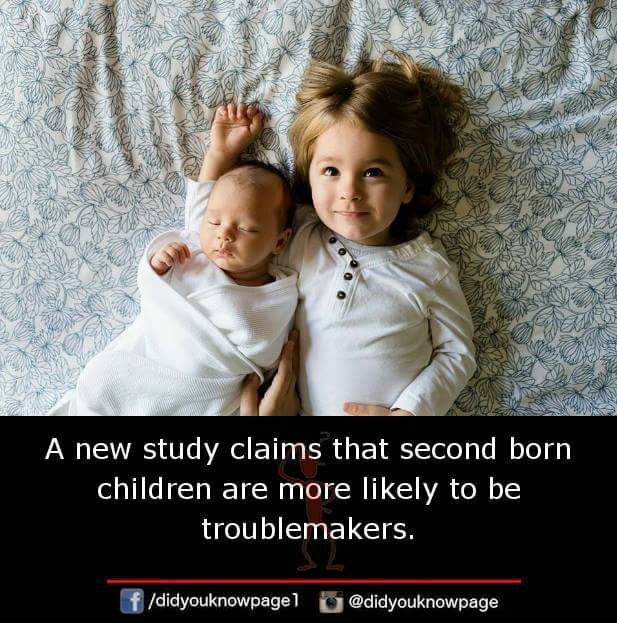 Once we have enough studies, if we see that a few find a real effect of birth order on personality but the majority find no effect, then we should probably abandon the theory of birth order and focus on other things that can affect personality. I'd say personality is a lot more complicated than just birth order. One study doesn't a whole theory prove! Not the answer you're looking for? Browse other questions tagged psychology parenting .